I don’t think I knew Hans when he put out his first six books, but I’m here now, and glad of it. Let’s get busy. 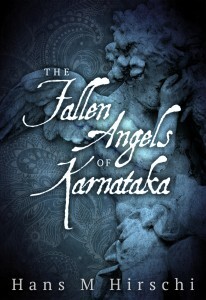 Hans, what song makes you think of your book, The Fallen Angels of Karnataka? This was not an easy question to answer and and I’ve been tossing and turning over this for a long time, as the story of the book is not very “pop” or “rock” even. I’ve contemplated pieces from Mozart’s Requiem (too somber as it is) to Beethoven’s Fifth (too majestic and pompous) to glamrock (too duh!) before I finally settled on a song. I ended up settling on this particular song from my favorite musical group (yeah, I am THAT old), because the lyrics do speak to some of the core beliefs expressed in the book, and lyrics are as important to a good song as the cover is to a good book. Fallen Angels obviously can’t fly, but the question the book raises is what it takes to make them fly again, and the eagle from the song does “high, high, what a feeling to fly over mountains and forests and seas, and to go anywhere that I please”, a symbol of hope and – above all – freedom. And it is the freedom that our fallen angels need more than anything else to be able to soar and fly once again. But the eagle also symbolizes Haakon, who’s traveled far, who’s seen the world, who’s got great stories to tell.. Listen och enjoy one of my favorite songs from Sweden’s greatest music export ever, and enjoy a corny 70s music video! A corny 70s Â music video… Oh, and you wonder why I have grown to love Hans? His sense of humor is right up my alley. In an isolated mountain town in Norway, Haakon dreams of traveling the world, pursuing adventure,Â seeing great places, finding love. His very first trip to London with friends from university offers muchÂ promise, yet soon after tragedy strikes.Â Still young, and mourning the loss of his lover, Haakon is not ready to give up on his dream, so when aÂ rich Englishman offers him the chance to join him on a tour of the world, Haakon takes it, daring to believeÂ that his dream is finally coming true…but at what price? 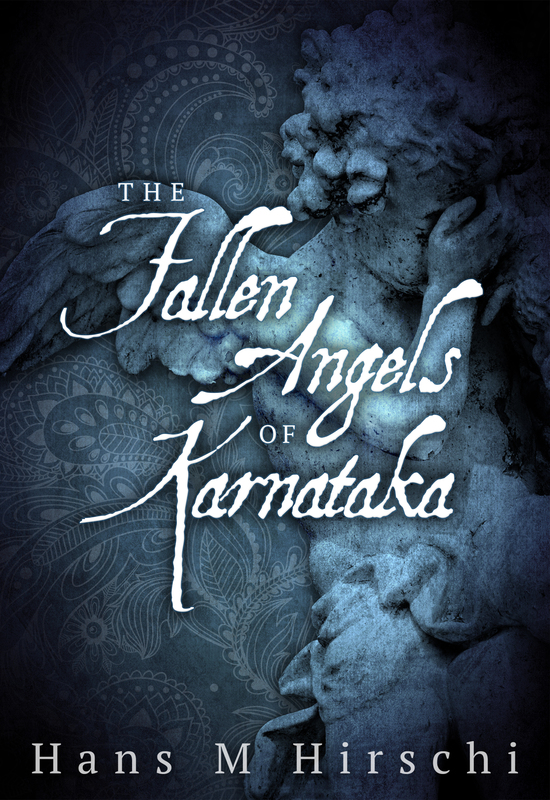 The Fallen Angels of KarnatakaÂ is a novel filled with adventure, life’s hard-learned lessons, loss, despicableÂ evil, and finally, love and redemption. You know you need a copy. I sure do! Connect with Hans. You’ll be glad you did. Angela Conrad came into my life in a funny way: she was referred by one of my editing clients — but not for editing (sadly. You guys know how I love to edit and wish the world could be my client!). She came to me looking for someone to format her e-book. Of course, I have someone handy for that! And look: she also used my good friend Carol for her book cover. Geez. If I’m not helping build community here at West of Mars, I am a banana. And I may be wearing a yellow shirt today, but that’s as far as it goes. Yeah. Two-stop shopping, for all your publishing needs. That’s us at West of Mars. So. Livy is out at Amazon only (sorry, folks!) and that means Angie has one more thing to do before she can truly say her book is for sale. YES! Answer the Famed One-Question Interview! Angie, what song makes you think of your book? Dear PrudenceÂ by the Beatles.Â The lyrics of the song are simple and innocent and praise the beauty of nature and the lines. I think I’d have to agree! Ready for the description from the back cover? 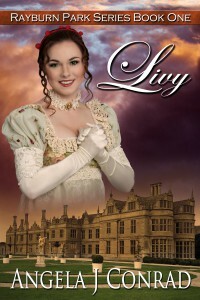 Livy is an 1816 regency historical romance, taking place in London and the countryside of Suffolk and Essex, England. Livy is the first of a series, Rayburn Park. This book sparkles with witty conversations and heartbreaking romance. 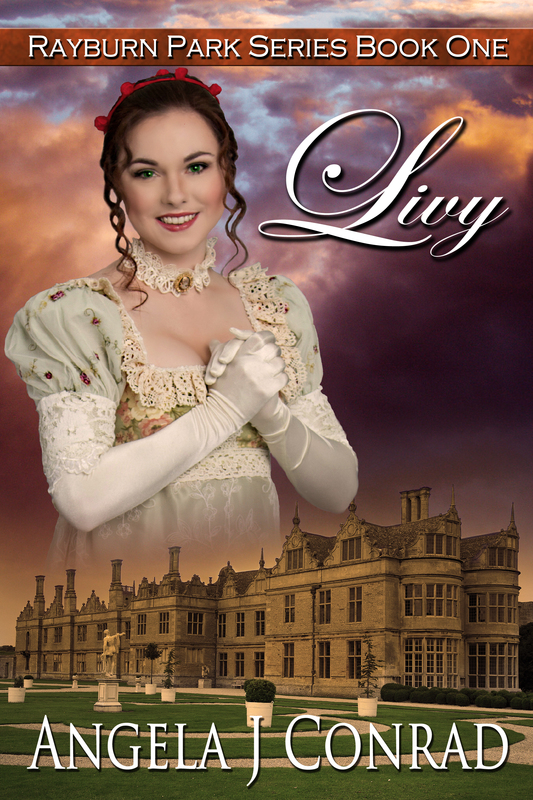 Livy, Lady Olivia Rayburn is an artist who has sketched and dreamed of marrying her childhood sweetheart for eleven years. Sheltered, living on her viscount brother’s palatial estate, Rayburn Park, she hopes for a future with Lord Nathan Wentworth. Now on her twenty first birthday, beautiful and kind Livy overhears Lord Nathan tell her brother Sam that he will never offer for her. Nathan has other plans. Driven by hurt, despair, and compassion, Livy goes into the park and meets another gentleman, the handsome Earl of Essex who needs a wife immediately, that day, and she says yes to his marriage proposal. This starts the story of Lady Winston, the Countess of Essex, her loves, struggles, heartbreaks, and joys. Livy’s love story, her marriage to a rogue and her growth as a woman intermix with the saga of Rayburn Park, a thoroughbred racing park in Newmarket, and its four owners, all dashing, unmarried lords. I love a good Regency, and this one sounds like fun. To marry a man you only met that day… brave woman! This has been a funny week, because I’ve had two authors fighting over the spotlight this week! 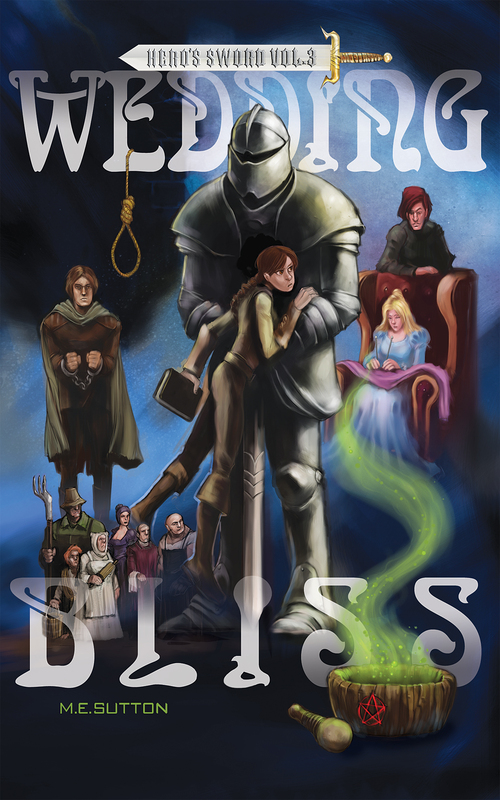 So, Mary, what song makes you think of Wedding Bliss? Okay, it is genre inappropriate. It might be age inappropriate, I’m not sure. But I absolutely cannot think of the word “wedding” without thinking of Billy Idol’s WHITE WEDDING. I’m not exactly sure why. The lyrics of the song don’t really relate to the subject matter of the book. But the two are twined in my mind. And maybe that’s not the most horrible thing. When the song hit it’s popularity (1982) I was, um, much younger than I am now. Billy stayed popular while I went through middle school, the same age Jaycee is in the book. So when I went to dances, or hung out with my friends, chances are I would hear WHITE WEDDING. So when I hear it now, on the Sirius/XM 80s channel, it takes me back to eighth grade. Not all of my memories of that time are fantastic, but the song always makes me smile. Here it is on YouTube. We won’t discuss how old I was before I understood what White Wedding was actually about. So yeah, this isn’t terribly appropriate… but who cares! That’s the beauty of inspiration. You never know what’ll make it take hold or where it’ll take you. Ready for what the book’s actually about, since it’s not about sneers and bleached hair and bad 80s fashion? Lyla has long believed that Roger and Lady Starla belong together even though Roger insists that Starla is above his station. When handsome and noble Perry Goodhaven shows up and wins the ladyâ€™s affection, it seems at quick glance a more fitting match. Soon after Perryâ€™s arrival, Roger and other servants close to Lady Starla notice a change. She sleeps a lot more than usual, is lethargic when she is awake, and defers important decision-making to Perry. With Roger incarcerated over false accusations of treason, it is up to Jaycee, aka Lyla Stormbringer, to clear Rogerâ€™s name and uncover the truth about the man positioning himself to rule Mallory with an iron fist. Pick up your very own copy. Bill Idol not included. *Note about availability: the book’s right now only at Amazon, but will arrive at all other platforms in the fall. Can I wait that long? Ugh. Perhaps not. Let’s welcome a new friend to West of Mars. 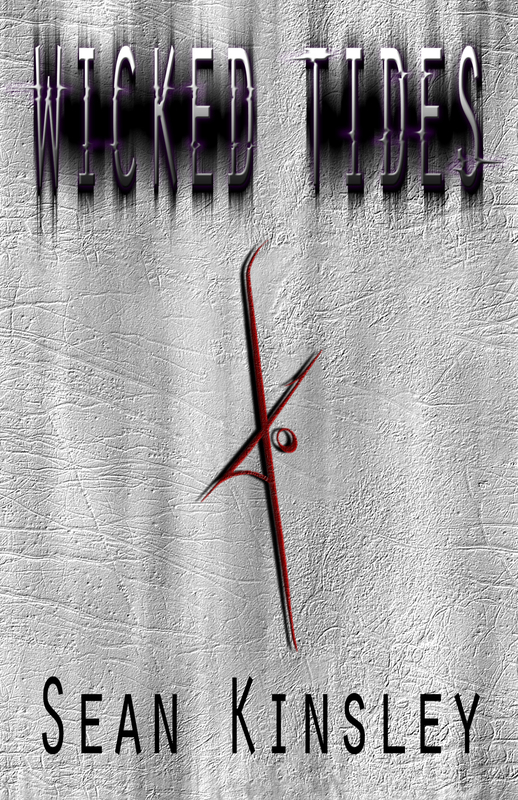 Sean Kinsley popped into my inbox, said hello, and told me about the song that makes him think of his book, Wicked Tides. Short and sweet, huh? And this is some good Susan music, too. Crunchy but with an ethereal vocalist. Why haven’t I heard more of this band? This is good stuff! After intercepting a convoy containing crucial intelligence and decrypting the data, the Kionic Pirates now know their time of plundering the seas may come to an end. An alliance has been formed between the various factions they prey on. With little time to spare the Kionic Pirates begin their own defensive preparations which include sending out various special forces teams to perform recon and sabotage missions. An area of the world that has not seen major conflict is about to erupt. Run by powerful politicians, kings, warriors, spherists, assassins and underground networks, chances for personal gain are rife. Spherists, people who are able to draw upon and control the energy of ethereal realms, are utilized in everything from encrypting information, communicating long distance, spying and contract killing. Everything is about to go down and the Kionics are right in the middle of it. One Kionic spec ops team, lead by Exphasia, a spherist, is sent to the city where she grew up. Followed by her brother Merritt and her hard-headed friend, Rezen, they soon learn that there is far more going on than initially perceived. Aided by an assassin, who partly shares in the Kionic’s own goals, they must recover as much intel as possible and destroy what they can before the Alliance fleet leaves dock. Communication and other spherical activities are being scrambled and hampered by an unknown storm brewing over the mountains to the east. Something is wrong. Complex, like the song. I can see how it fits, already. What was it? Last week that I put out a call for reviewers for my buddy Faith Cotter’s new short works. As I said then, Faith is a buddy from the Boy Scouts, a woman I bonded with over writing, archery, and the difficulties of being a female Boy Scout. Â She’s good people, and I’m proud to know her. And as I said, I’m pleased as anything that she’s joining us in the publishing world. Be good to her. Buy her stuff. Read it, leave a few words of review. Or contact her for a review copy. Remember, reviews help sell books. So… off the soapbox and onto the important stuff. Faith, what song makes you think of your story? I first heard Blinding three years ago and the minute I heard it and really dug into the lyrics, I knew that there was something about this song that was very strongly connected to what I write aboutâ€”the ghost that haunts all my stories, if you will. As for the story itself, and how it connects with this song: Yes, this is a story about two young girls. But I know that if I am going to write a story that centers around children, there needs to be something else there, something that children can see and something that old folk like me (aka adults) can see as well. 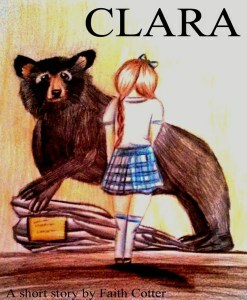 I wrote Clara as a story heavy with familiar and unfamiliar motifs and themes in the hope that different readers will interpret those themes differently, based on their lived experiences. For some, it will be political; for others, maybe they will feel nostalgic. For me, this story is really about waking up. Itâ€™s about shaking off sleep and standing up and taking off. And through the use of the songâ€™s motifs and archetypes as familiar to us as our childhood school days, Blinding encapsulates Clara so well. And that’s all I want to say about it. The rest, reader, is up to you. So… if Faith is old, what does that make me? Decrepit? Catholic school kid Clara Cooper wants to go home. She has some unfinished business to attend to, and really needs God to give her attempt at truancy a bit of heavenly aid. When she fails to convince the nurses, the principal, and her mama that she is sick enough to leave school, she decides to take matters into her own hands. Over the course of her small adventure, she makes friends with an old bear and fellow truant Nhi Nguyen, and discovers that there are lessons that can never be taught within the confines of the towering school that makes up her world. It reminds me of my own Mannequin… a young girl, learning lessons of life. Pick both stories up and see what you think. Do they compare? It was looking like the spotlight would be a bit dark this week when Karen Docter popped into my inbox with a new book! The lady couldn’t have had better timing if she’d tried. What song makes me think of my book, Killing Secrets (A Thorne’s Thorn Novel)? Martina’s song is about a controlling man who uses his wife without giving anything back to feed her or her dreams. The song reminds me of Rachel James, the heroine of my new romantic suspense thriller, Killing Secrets. Rachels ex-husband was more controlling than the man in Martina’s song, and he kept her from leaving him by threatening the little girl she’d die to protect. She escapes him for a few months when she helps put him in jail. In Killing Secrets, he finds her and will do anything to get Rachel and little Amanda back. But Rachel’s learned to fly and she’s not going to be caged again. Meeting her real hero, Patrick Thorne, she finds a way to make her dreams come true. Even he recognizes that Rachel is a broken wing when he meets her, but he falls in love with her as they get to know one another. In many ways, he’s as broken as she is. Together, they heal past wrongs and expose the secrets that dominate their lives. I understand that desire, to never be caged again. Ready for the book description? Rachel Jamesâ€™ ex-husband is released from prison determined to reclaim her and her little girl â€” the child is his key to controlling the James fortune. Frightened, Rachel flees to Denver with the child who hasnâ€™t uttered a word since her daddy went to prison. Contractor Patrick Thorne wants nothing to do with another of his parentsâ€™ charity cases. He failed his own wife so abysmally she took her own life as well as his unborn sonâ€™s. After two years, itâ€™s time to concentrate on the bid heâ€™s won and the saboteur trying to destroy his construction firm. Oh, nice! I think I need to read this one. Karen, you’ve made a fan! And connect with Karen, too. You’ll be glad you did! People sometimes ask me what’s the purpose of a writer’s group in today’s world. Why not connect online and be done with it all? Because there’s magic when you can connect in person and realize the person you’ve gotten to know online is so much more interesting in person. Such it is with my buddy Jon Sprunk, who is a true writer pro and a super dude. And he’s got a new book out, as well. Which means he’s taking a turn in the spotlight. Jon, what song makes you think of your book? Answer: “Revelations” by Iron Maiden. I’mÂ a child of the 80’s metal wave. This song in particular evokes the majesty and mystery that I tried to put into every line of my new epic fantasy, “Blood and Iron.” But, of course, I’m not writing just for the metal crowd. This new series is about the clash between rival cultures, the friction between social strata, and the real price of liberty. You won’t elves or unicorns within its pages, but you will find magic, the kind of elemental sorcery that can destroy as well as create. I hope you’ll give it a try. Wait. He said IRON MAIDEN??? Duuuuuuude. IÂ told you he was cool, didn’t I? Now, after all that, you totally need to know what Blood and Iron is about. This action-heavy EPIC FANTASY SERIES OPENER is like a sword-and-sorceryÂ SpartacusÂ set in a richly-imagined world. Get to know Jon. You’ll be glad you did. Now that Jett’s up and running with the reviews, I figured I’d take a few minutes and highlight the Rock Fiction she and I have been talking about. 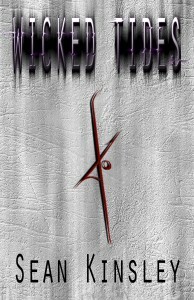 Let’s start with Kylie Scott’s novel, Lick. And, of course, a lick can be what one does with one’s tongue. Preferably to a willing partner. There’s more than a little confusion surrounding this book. St. Martin’s says it’s being released in May 2014. GoodReads says Momentum put it out in July 2013… is this a self-pubbed book gone big time? Well, hopefully I can get my hands on a copy for Jett and we’ll let you know. My radar’s pretty wide and Rock Fiction comes to my notice all the time. This one comes from powerhouse writer Iris Johansen (a writer I’ve heard a ton about but have yet to crack the spine of. Hmm. Time to fix that? ), but … I’m not 100% certain it’s Rock Fiction. I need some of you guys to give me some clues, maybe send me a link to put up on the Rock Fiction page. The jist is that this millionaire dude discovers a woman with a voice like a lark. She’s world-famous and … somehow easily spirited away to a house in the hills, isolated from her life, her security team, and her career. Can he win her over?